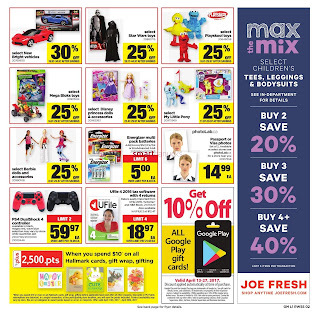 Max the Mix select children's Tess, Leggings and bodysuits see in-Department for details, Buy2 save 20 %, Buy 3 save 30 %, Buy 4 + save 40 % limit 5 items per transaction. My Little pony save 25%, Barbie dools and accessories price 25%. Energizer multi pack batteries price 5.00 ea limit 6, Passport or Visa Photos price 14.99 ea, PS4 Dualshock 4 controller price 59.97 ea, Ufile 4 2016 tax software with 4 returns price 18.97 ea limit 4, Passport or Visa Photos 14.99 ea, PS4 DualShock 4 controller price 59.97 ea limit 2, Ufile 4 2016 tax software with 4 returns price 18.97 ea limit 4. Get 10% off all google play gift cards! valid April 14-27, 2017. Discount applied automatically at time of purchase.